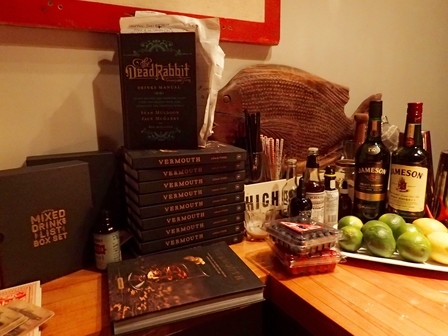 Welcome to the Vancouver chapter of the Bartender’s Book Club, a gathering of cocktail nerds and spirit enthusiasts from both sides of the bar, who meet to explore the tastes and techniques of a boozy book every month. "You're all cutting your own ice tonight." Vancouver Rowing Club bartender, Jason Laidlaw, hauls a crystal clear block from a cooler to the bar, accompanied by 'ooohs' and 'aaahs' from the gathered crowd. 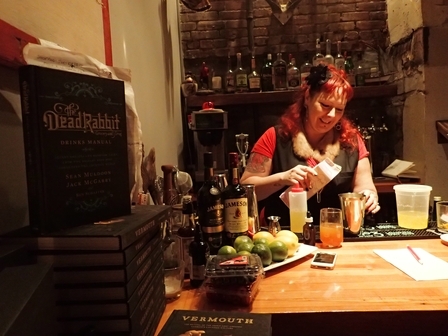 Behind the bar, Kylie Bartlett, bartender for Vancouver's Odd Society Spirits, consults the pages of the Dead Rabbit Drinks Manual and puts the finishing touches to a Pistache Fizz. The club began back in February 2015, after Kylie had spent the evening at a similar book club in Victoria on neighbouring Vancouver Island, "I thought it was a great idea and I wanted to do it, but I didn't have the balls to pull it together," she says. "I suggested it to Jason and we thought we could do it together. 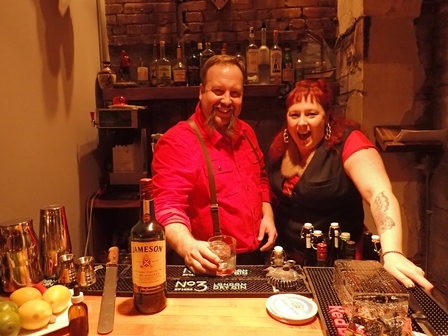 I was inspired by it as a fun thing to do, and to connect and grow the bartending community." "It's not a revolutionary idea to have a book club," grins Jason. "But it's cool to get together and geek out over things that you'd likely not do at home or perhaps wouldn't be the right fit for your bar programme." 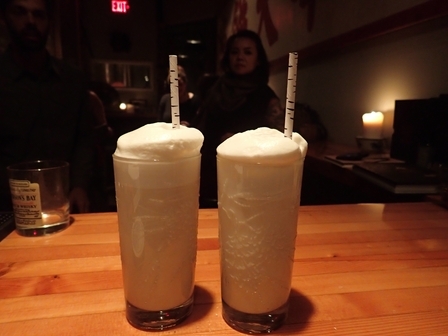 I joined them in a back room at Mamie Taylor's restaurant in Vancouver's Chinatown for their tenth session where they were dissecting Sean Muldoon and Jack McGarry's Dead Rabbit Drinks Manual. 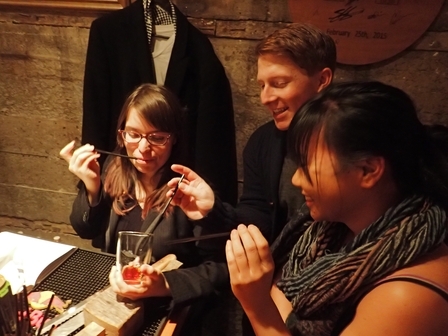 Unlike most book clubs, this has a more hands-on element, with the participants trying out techniques from the books and creating by-the-book cocktails. As Kylie poured the drinks, the conversation turns to nut milks and the various advantages of different bags. We straw-taste the finished drink and agree that it needs to be nuttier... which in turn leads to a debate as to the quality of pistachios in New York versus the ones in Vancouver. "Maybe if it was done sous vide?" someone offers. As a discussion on the relative merits of saving or discarding nut-soaking water continues, Jason pulls out an induction burner and saucepan and starts work on the next cocktail, the Lamb's Wool. 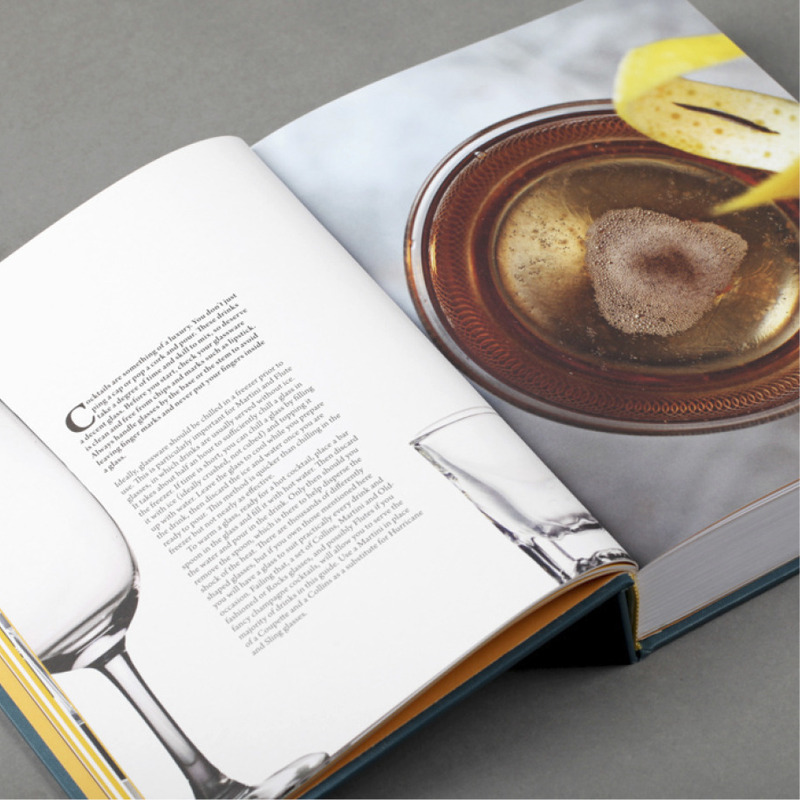 "I don't have a briki (the Greek metal coffeepot that Jack suggests using to prep this) but I've really liked how non-tech this has been, compared to others; it's a pretty straightforward book and you can get a tasty drink even if you don't have all the toys." Before we start cutting the ice for the next round, someone pulls up YouTube on their phone and we gather round to watch Ueno Hidetsugu, of Tokyo's Bar High Five, create icy magic, "Ahh, he's tapper, not a smasher." nods Kylie, and as we queue to imitate the master, I ask why the focus on ice. 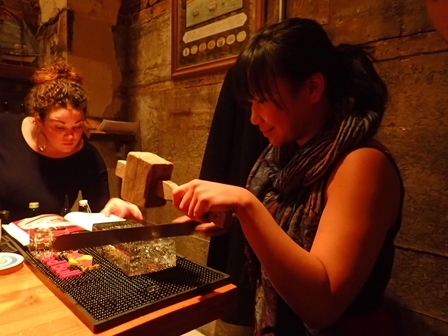 "It plays a big role at the Dead Rabbit, but ice is so important," says Kylie. 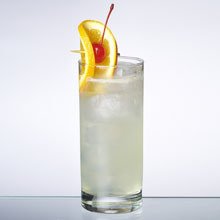 "You learn that when you first start to pay attention as a bartender. Dilution plays a huge role and you can get kind of obsessed by it." 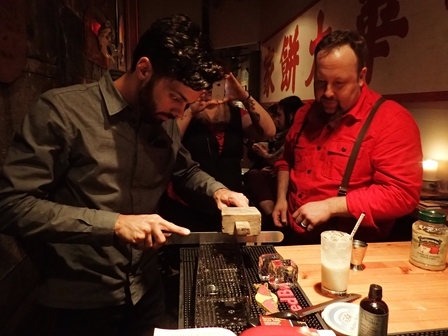 Focus shifts to the practicalities of cutting: "You don't need pressure," advises Jason. "This is about thermal conduction melting through with the blade, which you then just... tap... and it'll cut smoothly." As everyone lines up to try, I ask one of the non-industry members what she enjoys about the club, "I like how casual this is," says games developer Sarah Roland. "I made friends with the bartender at Bambudda and he invited me along to the Drunken Botanist session. 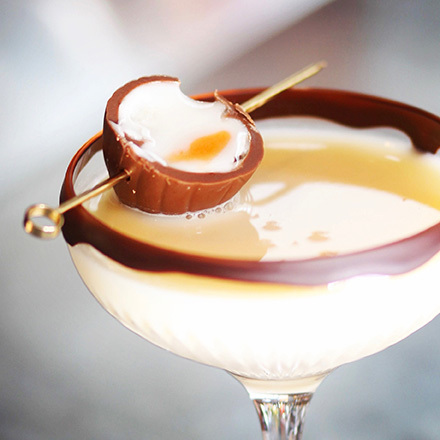 I like plants and I do make cocktails at home, this has given me some really cool ideas." Like? 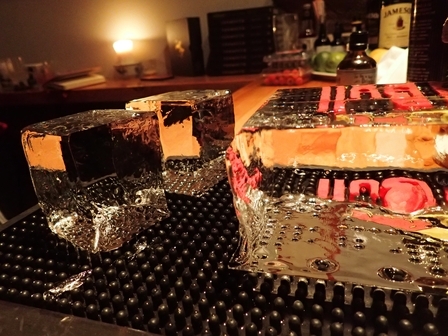 "Well, definitely doing this with ice at our next work party!" The industry folk who come see it as an extension of the kind of conversations that you'd have at the bar with other bartenders - if you could pour a few drinks and not have to worry about serving other customers. Regular Tim Logan, bar manager at Blacktail agrees, "It's a good opportunity to chat with other geeks in the industry about trends and enjoy a cocktail or two. I've learned so much; during the Bar Book session, we did a comparison across gins - some had been infused under pressure with oak chips - and it was really interesting. It clearly put into perspective what the role of oak is in the palate and how it develops through the course of barrel aging - or in this case, chips in a nitrous whipper." He shoots me a geeky grin before heading behind the bar to make the next drink. "That's definitely something that's changed over time," explains Jason. "At the beginning Kylie and I would do all the stuff and present to the group - but we've changed to make it more collaborative. We want it to become more of a group effort, I'd love it to become its own entity." 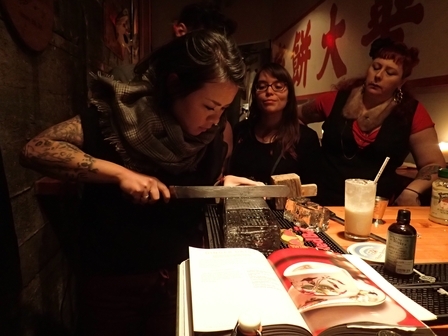 Highlights over the past ten months of the Vancouver Bartender's Book Club include: Amy Steward Skyping in live for a session with her Drunken Botanist book, Champagne sabering with a Katana blade for the Widow Clicquot session and group gel clarification practice with Dave Arnold's Liquid Intelligence. 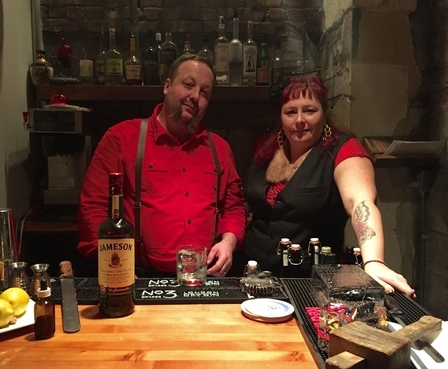 "You get to build a collection of great books, and learn a bunch of new techniques - and not just from the book - but from other bartenders," enthuses Jason. "It's a great exchange of ideas and really helps with education." "And it's a lot of fun!" chimes in Kylie. "It's definitely given me confidence to try new things. I've been wanting to get into the Canadian rainforest and explore what I can use from nature, Amy Stewart really helped with that. I've been doing foraging tours with Camille Flanjak and exploring obscure local botanicals to use in my drinks. It's amazing how much is out there. Everyone should do this." 1. 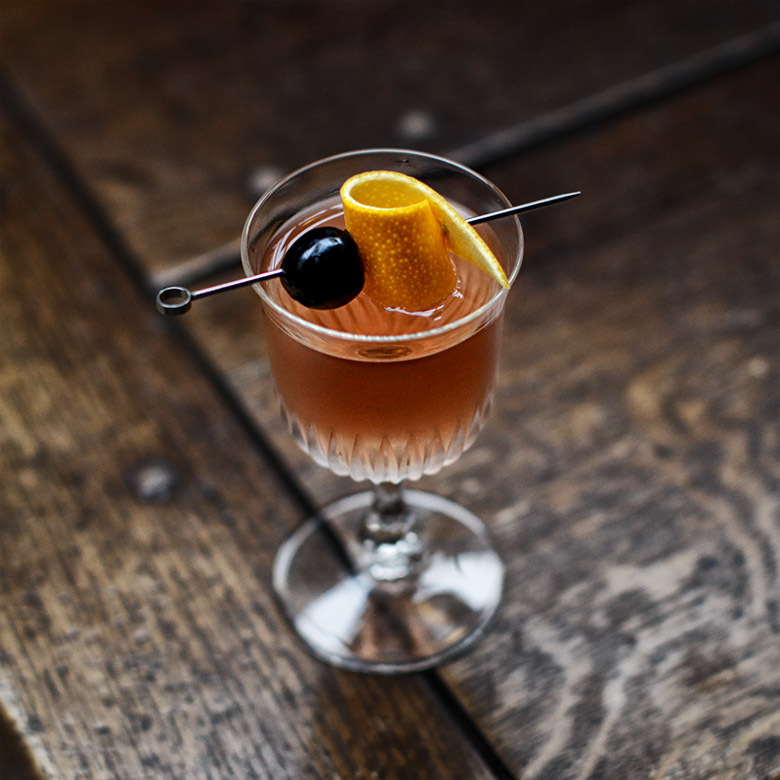 Find a sympathetic cocktail bar with a private room or semi-private space. Hosting the book club can be a real win for a bar: if you have it on a night that's usually quiet, it'll drive business for them, also, they'll have the book on sale for the month beforehand which encourages customers to stay for a drink when they pick up a book. 2. Get support from your local spirit reps. We wanted the book club to be free and we also wanted to be able to make drinks from the books. One of the bars that we worked with also gave us some money to use for products and books. 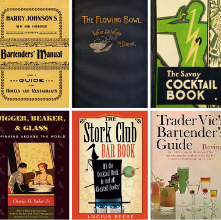 Everyone's been really helpful with this as they can see the bigger picture of growing cocktail culture and supporting bartender education. 3. Find a local book store and get them onboard. They can probably get a good rate for the books and might sell them to you at a discounted price as you'll be buying in bulk. 4. Spread the word through social media - if you have a Bartending Association they'll usually be happy to mail to its members. This is all about big picture stuff when it comes to growing your bartending community, especially if you're in a smaller town. 5. Have a charitable element. In Vancouver we collect for the BC Hospitality Foundation which helps out people in our profession if they get sick or can't work. It's a really valuable organisation and we're so proud of every cent that we send to them.